UK, 1990, 100 minutes, Colour. 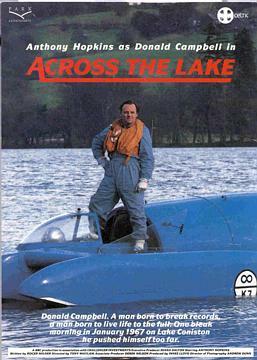 Across the Lake is a BBC telemovie about the last days of speed champion Donald Campbell. Campbell had broken land speed records and was aiming to break lake and water speeds in the lake country of England. He died in an accident on the lake in January 1967. The film is rather prosaic in its presentation of Campbell as a personality, his family, his obsessions, his mentor and training, the media and his performance. The strength of the film comes from the presence of Anthony Hopkins as Campbell. Included in the cast is veteran actress Phyllis Calvert as his aristocratic mother. The film was directed by Tony Maylam, whose credits are as diverse as the boys' own adventure, Riddle of the Sands, and the Friday the 13th American rip-off, The Burning. A glimpse of a significant sportsman. 1. British telemovie, biography, insight into racing, the obsession with breaking records? 2. The lake district, the lake, the homes, clubs? A setting for Donald Campbell's last days? The musical score, songs? 3. Anthony Hopkins' presence as Campbell, the physical resemblance? His background and achievement? His drive and obsessions? His mentor, the relationship, friendship, advice? The preparation of the machine for the water speed record? The tension of the relationship with his wife, love for her, devotion? Yet the tension, his absences, the humiliation at the party, his attempts at reconciliation? His flirtation with the journalist? His womanising? His relationship with his mother, loving but tense? His interest in the media, manipulating the media? A performer? His training, tryouts? The build up to the final attempt? His self-reflection, achievement? His determination? His foolhardiness? His death? The film as a tribute after 20 years? 4. The portrait of the Campbell family, his wife and her career, nightclub singing? His presence? Love for each other? His absences, the tensions? The children? His humiliation of his wife, her response? The night before his attempt, the phone call? Her mourning him? 5. His mother, strong, relationship with her son, influence and lack of influence? The tryout? Her listening to the news of his death? Self-composed? 6. His mentor and trainer, lifelong friend? Advice, quiet presence? Shrewd knowledge? The machine, the building, the refining and perfecting of it? Advice? The family background? Celebrations? The final day, observation, radio contact, his being ignored? His comments to the press about Campbell, his memories? 7. The woman reporter, questioning Campbell, flirting, the affair? The woman at the party and the affair? His relationships - and his love for his wife? 8. Friends - and clashing, especially about money, publicity? The media and his manipulation? Their attendance, observation, reporting? The impact of his accident and death? 9. The young boy, friendship with Campbell? The symbol of the teddy bear? His finding it - coming to the surface of the lake? 10. The action sequences - interest, excitement? A reverential portrait of Campbell?